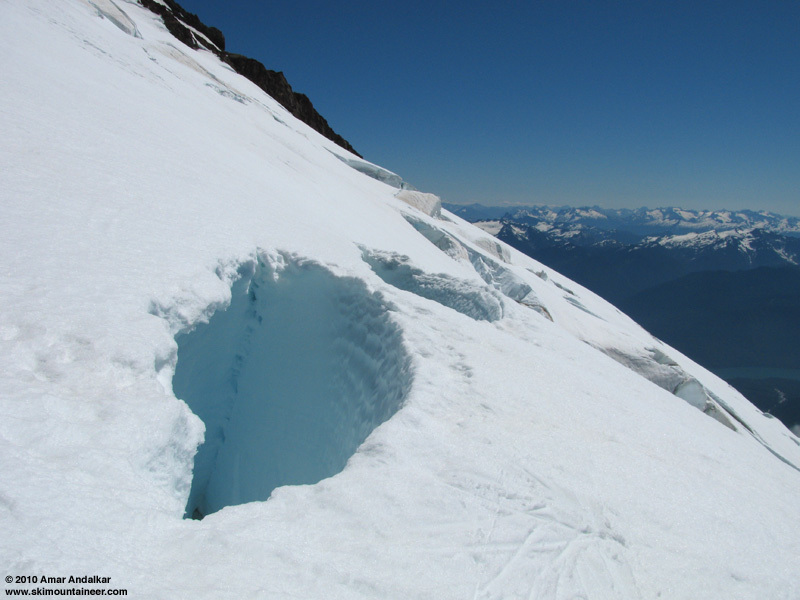 The Squak Glacier route on Mount Baker remains in AMAZING condition right now, offering a ski run of over 6000 vertical feet in mostly excellent snow conditions. Smooth corn snow from the summit plateau down the Roman Wall and all the way past 7000 ft, with continuous skiable snow extending down to the 4600 ft saddle on the Scott Paul Trail (typically lumpy and bumpy down low). Crevasse hazard remains minimal on the route, a few cracks are starting to open, but most are of little concern to skiers. Carving sweet corn on the rollover atop the Roman Wall (note skin track at left). Kyle Miller joined me on this impromptu last-minute trip. A 4am departure from Seattle had us hiking up the bare Scott Paul Trail just before 7am. 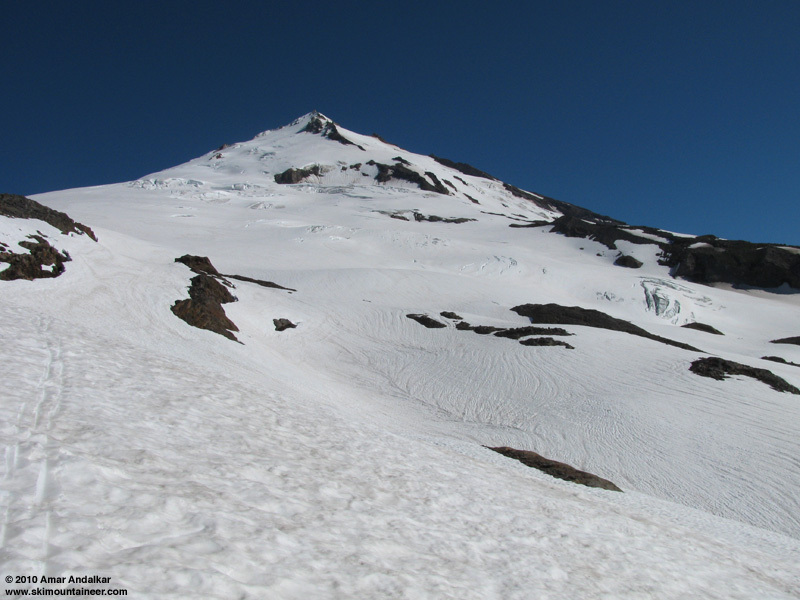 The lowest snow patches in the forest are near 3900 ft, large snow patches begin near 4400 ft, and continuous snow is reached at about 2.5 miles and 4600 ft, just below the saddle with views to Sherman Peak and Mount Shuksan. Skinned up from there along the ridge, bypassing Crag View to the right to access the Squak Glacier near 6200 ft.
Overview from 6200 ft of Squak Glacier below Sherman Peak. Enjoyed a beautiful pleasant skin up the glacier, sunny and warm with an occasional breeze, mostly heading straight NNW towards the crater rim, occasionally zigzagging a bit right and left to avoid obvious sags and a few open cracks. There is a major open crevasse near 9000 ft, but this one can be crossed as we did on solid full-depth isthmuses of glacier (not really bridges, they are 100+ ft thick), or otherwise circumvented by going far to its left (west). 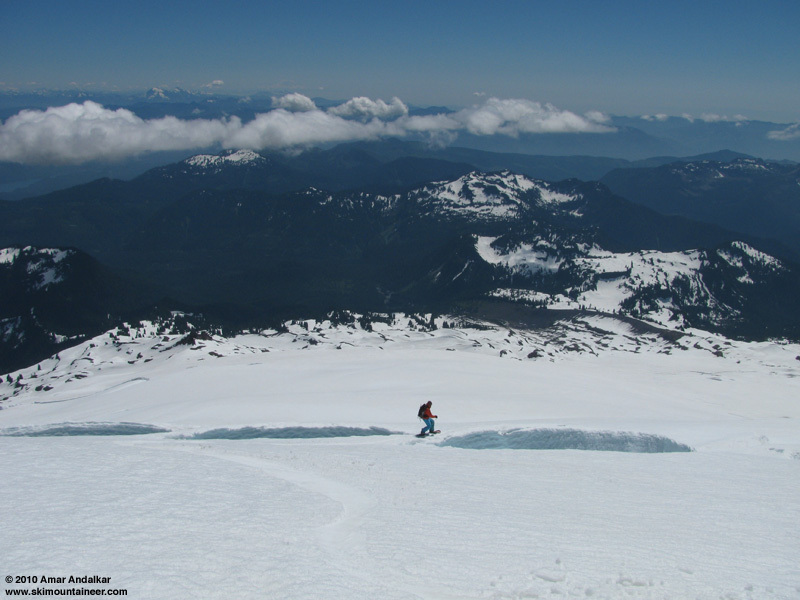 The snow surface on the Squak is very smooth for late July, exceptionally so from about 8000 ft to 9000 ft, and quite surprising given the past half-month of sunny warm weather. Almost empty on the route today, we saw only one other party of 4 skiers, who turned around near 8500 ft. Looking along the crux crevasse near 9000 ft -- those apparent "bridges" are really full-thickness sections of glacier. Skinned easily all the way up the Roman Wall on well-softened corn snow, avoiding the crevasses that are starting to open across the bootpack, and on to the summit of Grant Peak by 1:30pm. A 20-30 mph NW wind kept things chilly on the summit, despite temps well above freezing. Took a look down the Park Headwall, which looked absolutely smooth and in great shape (obviously bergschrund conditions were not visible from this angle, though). A group of 4 skiers who had come up the Coleman-Deming joined us briefly on top, before departing back across the summit dome. Across the summit plateau after descending Grant Peak. We skied down from the top at 2pm, schussing easily along a smooth bootpack trench across the slightly shingled snow of the summit plateau to the top of the Roman Wall. The somewhat firm snow on the flats softened immediately into sweet corn as the slope rolled over to its 35-degree pitch on the Wall. Nice smooth corn snow continued below the crater, and although some areas did become a bit sticky/grippy below 8000 ft, the snow is generally well-consolidated with no mush even well after 2pm. Even the heavily suncupped and runneled snow below 6500 ft skied OK, nicely softened in the mid-afternoon sunshine, with a quick cruise back to the trail saddle by 2:40pm. Took a short break and then hoofed it back to the car by 4pm, just about 9 hours roundtrip. Crossing the crux crevasse on the way down. 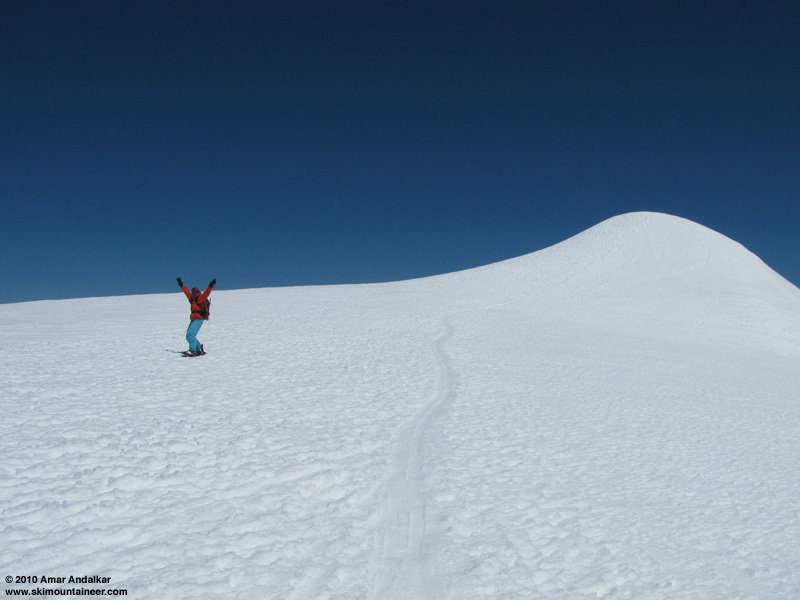 An exceptionally great ski day on the Great White Watcher, with beautiful sunny weather and top-notch summer skiing. About 7500 ft of gain for 6200 vert of mostly outstanding turns, hard to believe it could be so good in late July. Head on up there and get it while it's still smoooooth! Somebody pinch me, it is late July, right? Great pic of Kyle crossing the slot. Thanks. We were up there as well and saw you as we stopped @ Crag View. Got a few pics of you guys ascending below Sherman - you kept quite a brisk pace. We stopped around 8,000 as we had a newbie with us and just came to ski some corn for the day. Sherman also had wind above 8000', 20mph or so, and it nicely preserved the perfect corn for our late arrival on the summit where the snow was fairly stiff. From 10000-8000' the breeze was comfortable and the turns effortless on a smooth firm surface with an inch of buttered corn. There was a little grabbiness from 8000-6000', then excellent consolidated snow with small soft suncups from 6000' to the end of the continuous coverage around 4300' on the Scott Paul trail.� The only spot to watch out for crevasses was around 8000-8300', and for now they are easily spotted and traversed. Plagarism?� � �Glad it's still "perfect" and now even "AMAZING" up there. 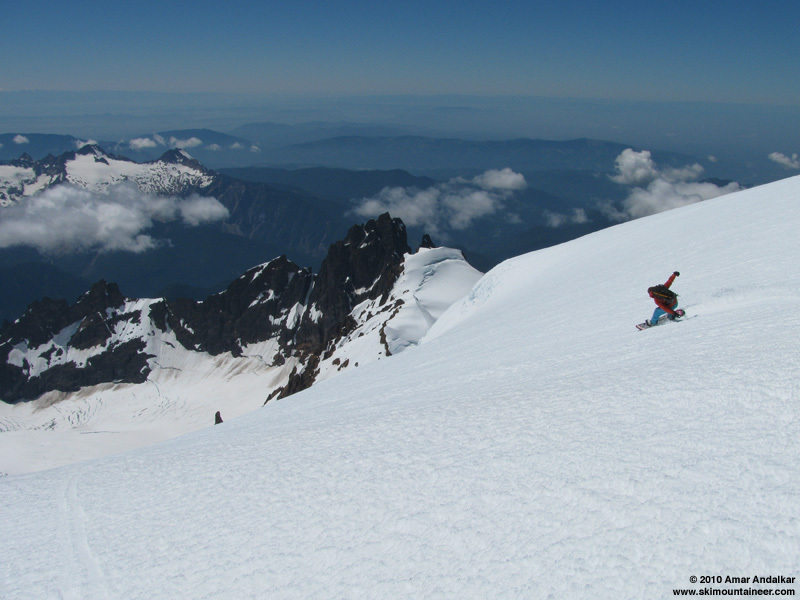 A Cascade skiing July by which to measure all others!